I belong to the northern part of India, and I reside in an apartment complex. 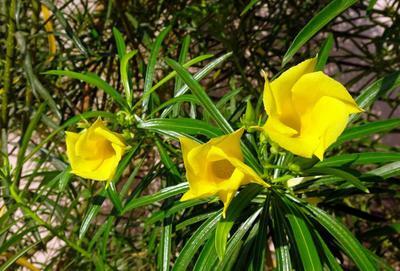 I wanted to know if it'll be suitable to grow a Yellow Oleander tree (also called "lucky nut" in certain regions) in a large container. I do, in fact, have a balcony which receives ample sunshine during the day where I intend to keep the pot. I'm not entirely sure why you want to have this extremely poisonous plant anywhere near you. The symptoms of poisoning from eating any part of it are extensive and very off putting. Dogs, cats and other animals are affected very badly from eating it, and humans have had the same effects too, ranging from vomiting to death. Having said all that, as it's classed as a noxious weed in parts of Australia, that generally indicates that it's hard to kill, therefore would most likely adapt to life in a pot quite nicely. Be careful when pruning it, because the latex like sap is also poisonous. Good luck with it - I know I wouldn't be trying to grow this plant anywhere, least of all on my balcony!